Clarence Aaron, among the eight to be freed under President Obama’s sentence commutation, was sentenced to three life terms for his role in a 1993 drug deal when he was 22. A few weeks ago, we wrote about the need for a sea change in sentencing laws after a 15-year-old boy, Traivon, was sentenced to six life sentences without the possibility of parole in prison in Virginia for his participation in an armed robbery. Draconian sentencing laws and mandatory minimum sentences have frequently been cited as one of the major sources for America’s modern-day problem with mass incarceration—a fatal combination of “tough-on-crime” policies and extreme racial bias and prejudice in the criminal justice system. But yesterday, amazingly, the pendulum in Washington swung farther away from mass incarceration. President Obama commuted the drug sentences for eight individuals in federal prison—two of whom were serving sentences of 15 years or more and six of whom were serving life sentences—for crack cocaine-related offenses. Most of these individuals will be released from prison in the next 120 days. In 2010, Congress made one of its first bipartisan breakthroughs on this problem with passage of the Fair Sentencing Act (FSA). The FSA reduced the sentencing disparity between offenses for crack and powder cocaine from 100:1 to 18:1. While 18:1 is still unfair and has an impact on the racial makeup of our prisons, it was a huge bipartisan victory to begin changing the political tide on this issue. All eight of the people whose sentences were commuted yesterday would already be out of prison under the newer drug sentencing laws. At a time like this, Root & Rebound feels incredibly proud to have President Obama as the leader of our Nation, with a political team that supports criminal justice reform at his wings. Since mass incarceration has been a policy and practice sewn by people in power, it can certainly be unwound by those people, as well. We must continue to believe that major shifts like the one that took place yesterday in Washington can and will continue to happen if we show our support. Also at a time like this, we take pause as a nonprofit that hopes to serve as a reentry center to our Bay Area community. Out of federal prisons and particularly out of California prisons and jails, more and more people are coming home. Most people in politics now recognize that mass incarceration is a huge problem in our country—expensive, a waste of human and financial capital, and the product of extreme racial bias in our criminal laws and enforcement of those laws. 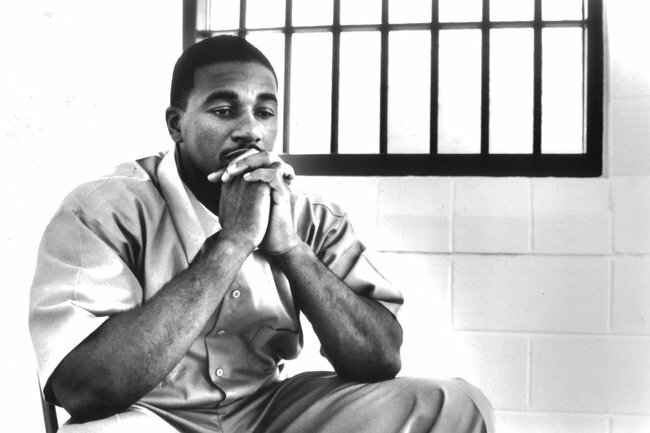 But as more people get out, what will we put in place to support their reentry? Over the past few months and into the New Year, Root & Rebound is devoted to answering that question in our local community. We hope that a sea change to reform our draconian sentencing laws will be coupled with genuine support for reentry and for people returning to the outside. This is the time. Join us! Check ’em out: Homeboy Industries in L.A. While visiting reentry programs and advocates in Los Angeles, we were very impressed by the model at Homeboy Industries. Homeboy Industries serves high-risk, formerly gang-involved and formerly incarcerated men and women with a continuum of free services and programs. Homeboy Industries also operates seven social enterprises that serve as job-training sites to program participants known as “trainees”. Their model of entrepreneurship and small business is an innovative way for supporting formerly incarcerated people in reentry. The model began because formerly incarcerated and formerly gang-involved men and women who had been working with Father Greg Boyle, their local priest and the founder of Homeboy Industries, were fed up – There are no jobs for us. Employers won’t hire us because of our tattoos or conviction histories. Everyone else sees our past as we are simply trying to move our lives forward. From these community concerns, the model of social enterprise at Homeboy Industries was born. Trainees work their way up through Homeboy’s social service programming to then gain entry level positions in maintenance and support at Homeboy, which can lead to to full-time positions at their social enterprises. 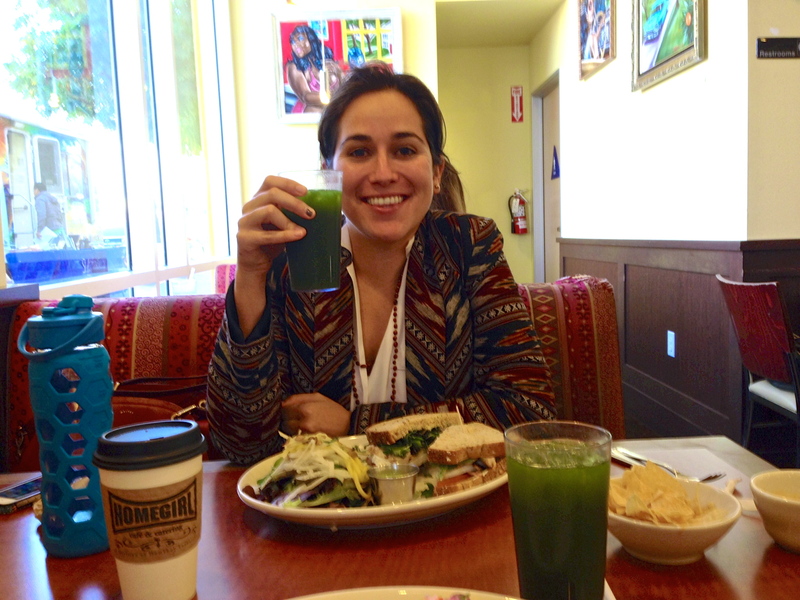 Katherine Katcher, Executive Director of Root & Rebound, eating a delicious Mexican-inspired sandwich and green juice at Homegirl Café & Catering. During our visit, we had to try out the lunch at Homegirl Cafe & Catering at their site in the heart of L.A.’s Chinatown. This restaurant is the REAL DEAL—delicious food, high-quality ingredients, professional and respectful staff. Many of the servers and staff were kind enough to open up about their life paths that led them to Homeboy. If you’re in L.A., we can’t say it enough—Go to Homeboy. Eat tacos, salads, sandwiches, guacamole and salsa, and green juice at Homegirl Cafe & Catering. Get baked goods and espresso drinks from the Homeboy Bakery. Homeboy even sells their chips and salsa in grocery stores around L.A., has an online ordering system for the bakery, and has a stand at LAX Airport in American Airlines Terminal 4, so you can find their products in many places. We are incredibly appreciative to Homeboy Industries staff and trainees in making our day there an incredibly meaningful one. We love the social enterprise model as a means for supporting formerly incarcerated people in reentry and creating new jobs. You can read more about the amazing impact Homeboy Industries has had on the Los Angeles community in the 2012 L.A. Times article, “Nurturing Hope,” available online. 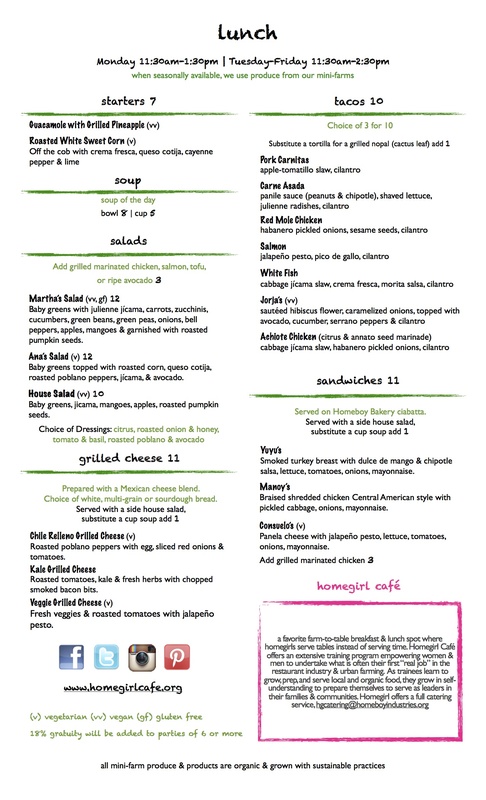 And if you weren’t already convinced to go in person, here’s a taste of the Homegirl Café lunch menu from Homeboy’s website (below). Thank you Homeboy! What is a “reentry lawyer”? We hope everyone had a restful Thanksgiving! We took the holiday weekend to recharge and we are now on a week-long trip in Southern California to visit reentry and legal services organizations—meeting with reentry lawyers, practitioners, and formerly incarcerated advocates in Los Angeles & San Diego. Despite being in our home state of California, the vast geographical landscape means that the work in Northern California and Southern California is quite distinct. While we encounter similar state laws and state actors in our efforts, the local communities and stakeholders are diverse throughout the state. For example, in L.A. yesterday, we had the incredible privilege of meeting with 5 lawyers at 3 different organizations who ALL do reentry legal services work. We say incredible because of the high caliber of work these lawyers perform for formerly incarcerated clients, but also incredible because, generally, it is hard to find 5 people across the COUNTRY who are doing reentry legal services work, let alone in one place in one day. Very inspiring that people are actually doing some of this important work! Reentry legal services actually means many different things. The civil barriers that people face are so vast that, when it comes down to it, “reentry law” covers the gamut of family law and family reunification, licensing appeals, credit issues, housing, federal and state benefits, expungement, immigration, and employment discrimination. Another reason reentry legal services differ from one organization to another is that reentry is not a single point in time—it is a continuum in a person’s life. The issues someone faces one year before release, the day he or she walks out the gate, one week or one month post-release, and then well into years of reentry are constantly evolving. The legal barriers to successful reentry do not end after 5 years of living in the community nor do they begin right when someone walks out the gate. It was, therefore, really interesting to meet with reentry attorneys who have been practicing in this area, some for many years. We were able to ask them why they have chosen to focus on certain client populations and certain areas of the law over others. Some of these choices are naturally made by organizations and individual attorneys who are responding to the needs of particular communities and are informed by those needs. Two groups, a New Way of Life and the LAW Project of Los Angeles have a greater focus on expungement work (clearing people’s records) with a mission of getting people back to work. These clients tend to be further along in reentry. Another group, the Pepperdine/ Union Rescue Mission Legal Aid Clinic has more of a focus on family reunification, credit, benefits, housing, and homelessness. These clients tend to be newly released. We obviously cannot cover all of the areas of reentry law nor reach all of the people exiting prison and jail in the state of California. For our first year of practice, as we incubate this work in the Bay Area, one of the biggest questions we are trying to answer is where we will start our work—that is, where along the reentry continuum we will focus our legal advocacy and what areas of law we will practice to be most responsive to the needs of clients. While we haven’t answered the latter question as fully (what exact services we will provide), we know that we want to focus on newly released clients, beginning our work with them pre-release, providing a bridge of services from prison to community, and into the first few years of reentry. We have chosen to focus on newly-released prisoners because this is where we see a huge gap. There is no organization in the Bay Area solely focused on reentry legal services for men and women at this earliest stage of reentry, and we have heard time and time again from formerly incarcerated people advising us in our work that there are huge legal and social service needs in this early stage of reentry not being met. This trip to LA and yesterday’s meetings with five committed attorneys at the three organizations helped us to better understand the various areas of reentry law that we can practice and the nuts and bolts of doing this work. While we aren’t ready to announce exactly what we are choosing to focus on (and still need to do more research, focus groups, etc. ), we feel that our service model is becoming clearer, and that something really amazing will come of all of our explorations and planning.